Freeport Grand Bahama – Freeport is the place for all things ‘baseball’ this weekend, as the games of the 12th Annual Andre Rodgers National Baseball Championships start Wednesday. 2014 marks the third consecutive year the event is being held on Grand Bahama, with The Grand Bahama Port Authority, Limited (GBPA) as a major sponsor. “It has been a pleasure working with Bahamas Baseball Federation (BBF) President, Craig Kemp, to bring the games to Freeport,” stated Ian Rolle, President of GBPA. ‘’We welcome the teams, coaches and supporters to Grand Bahama and wish them all much success in capturing the 2014 Championship title,” Rolle added. “These games have become a signature summer event for local teams and fans, while having a significant impact on the economy by way of hotel room nights, car rentals and at the surrounding eateries; it is beneficial for numerous small businesses. We encourage everyone to come out and support the players while enjoying the festivities,” continued Rolle. There are 34 teams scheduled to participate in this year’s event, representing a number of family islands including Abaco, Bimini, Eluethera, Exuma, Grand Bahama, Long Island, New Providence and Inagua. 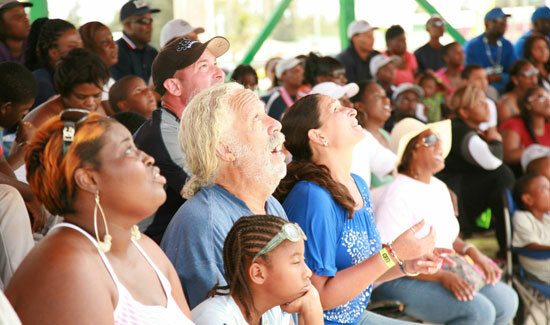 This year will be the first time that Inagua participates in the event on Grand Bahama. BBF President, Craig Kemp says he is looking forward to a fun and competitive weekend with the teams. “There are about 700 players and a support cast of 200 coaches, officials and fans participating, so the action on the parks will be great, “ cited Kemp. He also noted that hosting the games on Grand Bahama has offered a number of benefits. “With the proximity of the hotels and ease of movement to and from the events, the dynamics of Freeport really works well for the games relative to other destinations,” Kemp pointed out, adding that he looks forward to returning once again for the 2015 Championships. While games begin this morning, the official opening ceremony takes place on Friday evening at 7:00pm at the Jim White Baseball Park on Queens Highway. “Support on Grand Bahama has been exceptional, from both the fans and participating teams. This is a major event that requires the support of the community to be successful and the support of GBPA and corporate Grand Bahama has been phenomenal,” Kemp concluded. 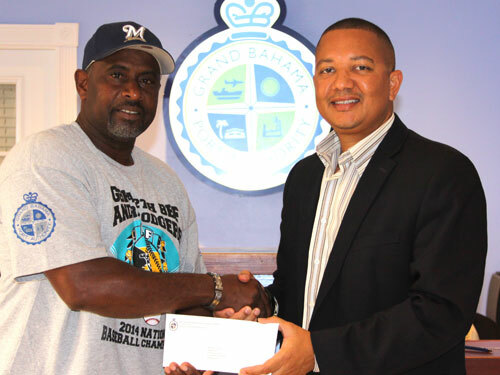 THIRD TIME’S A CHARM – Bahamas Baseball Federation (BBF) President, Mr. Craig Kemp, extends his thanks to Mr. Ian Rolle, President of GBPA for its continued support of the Annual Andre Rodgers Baseball Championships.